Travelers who come to Taiwan, will almost certainly be invited to visit the attractions on this one. Its name Taroko Gorge National Park. Actually there are many attractions in Taiwan formerly was known as Formosa. 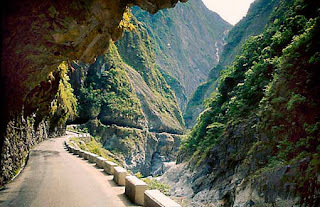 However, Taroko is definitely will be recommended to the travel agency or tourist travelers. The trip to Taroko really fun. Winding roads and the eyes looked off into the Pacific Ocean beyond. Very beautiful panorama. In Taiwan, the vehicle drove on the right side. Although the road is very fitting for the two vehicles passed, but generally the car drove at a steady pace and on a narrow road on the edge of a cliff. When passed, the buses will also reduce vehicle speed. It took about 3 hours to the Taroko National Park of Shangrila Leisure Farm. Entering the Taroko National Park, you will greet by stunning scenery. Just imagine, the bus drove next to the cliffs and gaping chasm. Towering wall in Taroko is a marble wall and lots of nesting birds nest. While the river water flowing beneath the blue. 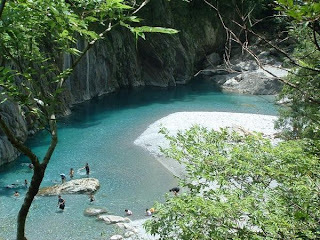 Taroko derived from the word "Truku" which means beautiful and amazing. Travelers do not need to spend money or free admission to enjoy Taroko. The best way to enjoy these cliffs and canyons that is off the bus and on foot. Walk the road at the edge of the abyss and look down, so crystal clear bluish-colored river water flowing between the rocks. There are special parking places in Taroko and it was not allowed to linger. The cool air in Taroko further add to the spirit to know better the longer will the greatness of the construction of roads and bridges here that it becomes an attractive location for foreign tourists.